Order will work with your business to help organize your physical space. We will also help organize email, file folders, files, supplies, etc. We implement easy-to-use file structures that enable you to focus more on running your business and less on mundane tasks such as finding missing paperwork and lost emails. We helped a well-known photographer organize their studios. We developed systems and spreadsheets for better organized bookkeeping, accounting and billing. We developed systems for incoming mail and paper work so the client can make sure no piece of mail is overlooked. We also helped the client organize photo and film storage and set up a system for mailing out work as soon as it is purchased and printed. We sorted four different areas of a local Artist’s studio. 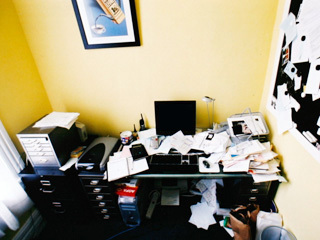 In the first area where the paperwork & office supplies are stored, we emptied and sorted old checkbooks, supplies that were no longer useful, organized and labeled CD’s, and created boxes for memorabilia and samples of projects the artist had previously completed. In the second area -- the media area -- we set up areas for master copies of projects in a variety of different formats and established an area for projects in progress, with room to grow. We also created a place for completed DVDs the client is selling and made space for shipping supplies so orders can be processed quickly. For the third area -- the art supplies -- we sorted, purged and organized old and new supplies, including paints, brushes, glues and other materials. The final section of the business we addressed was the literature section, which included various books, correspondence, teaching materials, etc. Ultimately, we kept in mind the changing needs of a successful artist and allowed room for the business to grow. "My studio was in such disarray that I could not work. Everything was everywhere and it was too overwhelming for me to tackle. Erica arrived, quickly assessed the situation and was able to come up with an efficient and economical plan that took in all of my needs and desires for this multi-use space. It was quite challenging because I edit video, paint and draw, and also have office and storage sections. Erica is just a whiz at organizing all kinds of 'stuff' into a sensible and easy to remember arrangements. She was also just terrific in helping me to decide what to keep and what to get rid of - again taking my feedback and needs into account. If all of this wasn't enough, she even went to the stores to pick up all of the organizing boxes and other things we needed and was extremely cognizant of price in her selections. My studio is just great now and a real pleasure for me to work and create in. I have been able to keep up the organization too! Needless to say, I had her come back and organize all (but one) of my closets in my home. This included turning a "stuff everything in" space in our TV room into a well organized and easy to access toy closet for our grandchildren who live nearby and visit often. Now both they and my husband and I can find the toys, books, games, etc. that we all enjoy together. I look forward to getting permission from my husband to let her organize his closet - that "but one" I mentioned!